Pittosporum Tobira 'Variegata' is a fast and moderate growing shrub that can be grown in USDA Plant Hardiness Zones 7B through 11. It prefers growing in a location that provides full sun, morning sun with afternoon shade, morning shade with afternoon sun or filtered sun and grows best when planted in sand, loam, clay or silt soil that is well drained. 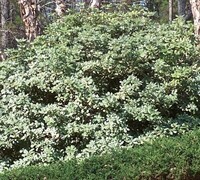 The foliage is white and grey / silver in color. 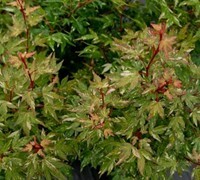 It attracts visual attention and is resistant to deer, drought, insects, diseases and heat. If you like fragrance, Pittosporum Tobira 'Variegata' has fragrant flowers. Variegated Pittosporum can be useful in the landscape along woodland borders, in foundation plantings, as a buffer or screen, as a background, in shrub borders, around decks, swimming pools, and other outdoor living areas, as an accent, in landscape beds or islands, to accentuate entryways or in small groupings and also in rock or xeriscape gardens or theme gardens. 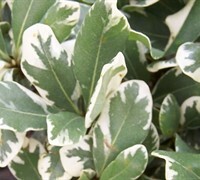 Variegated Pittosporum features beautiful creamy white and green variegated foliage. 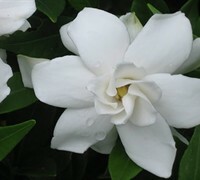 The flowers go unnoticed against the foliage, however they are pleasantly fragrant, perfuming your yard for weeks during spring with the sweet smell of orange blossoms. 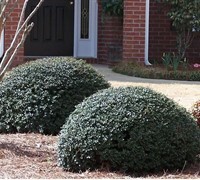 A fast growing shrub that will need some pruning if you don't provide ample space for it to grow. 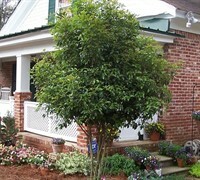 Mature height is 6 to 8 feet with an equal spread however plant can be kept smaller with pruning. 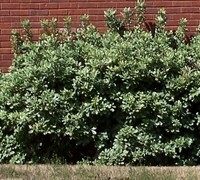 Variegated Pittosporum is useful in landscape beds and islands as a background, natural or formal hedge, stand-alone specimen, foundation plant, or can be "limbed up" to form a small small tree. 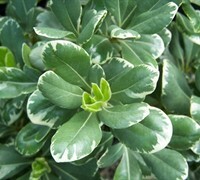 Variegated Pittosporum is easy to grow in well-drained loose soils and full sun to partial shade. 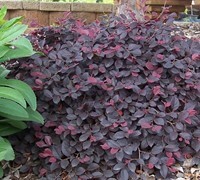 It is exceptionally heat and drought tolerant when established. No pruning neceary however can be pruned to control ize, for hedge or tree form. the plant is beautiful and your service great. Thank you. I got my plant in a timely fashion and in one piece!